Yule is the time of year when Pagans around the world celebrate the Winter Solstice. If you're in the Northern Hemisphere, this will be on or around December 21, but if you're below the Equator, your Yule celebration will fall in June. This Sabbat is considered the longest night of the year, and following Yule, the sun begins its long journey back to earth. Try some or even all of these ideas — obviously, space may be a limiting factor for some, but use what calls to you most. Winter is here, and even if the snow hasn't fallen yet, there's a definite chill in the air. Use cold colors to decorate your altar, such as blues and silvers and whites. Also find ways to include the reds, whites and greens of the season. Evergreen boughs never go out of style, so add some dark greens as well. In modern Pagan magical practice, red is often associated with passion and sexuality. However, for some people, red indicates prosperity. In chakra work, red is connected with the root chakra, located at the base of the spine. Holistic Healing Expert Phylameana Iila Desy says, "This chakra is the grounding force that allows us to connect to the earth energies and empower our beings." If you're using white on your altar at Yule, consider incorporating it into rituals that focus on purification, or your own spiritual development. Hang white snowflakes and stars around your home as a way of keeping the spiritual environment clean. Add plump white pillows filled with herbs to your couch, to create a quiet, sacred space for your meditation. Since winter solstice is the season of the sun, gold is often associated with solar power and energy. If your tradition honors the return of the sun, why not hang some gold suns around your house as a tribute? Use a gold candle to represent the sun on your altar. Cover your altar with a cloth in a cool color, and then add candles in a variety of different wintery shades. Use candles in silvers and golds — and sparkle is always good too! 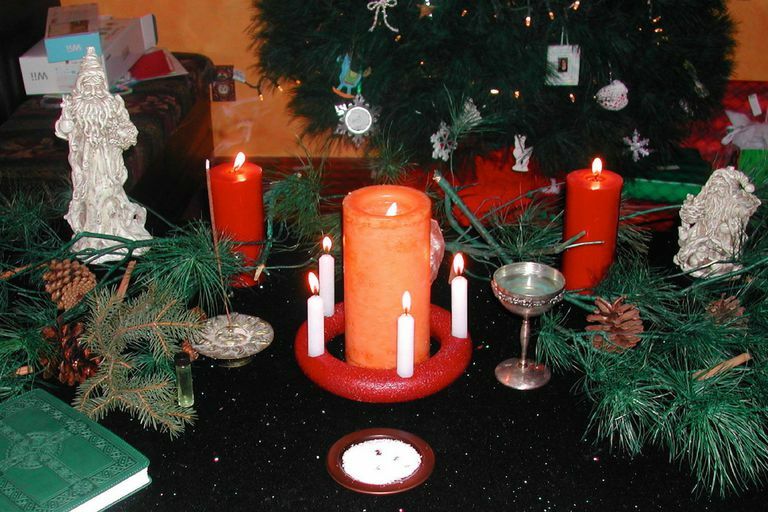 Yule is a Sabbat that reflects the return of the sun, so add solar symbols to your altar. Gold discs, yellow candles, anything bright and shiny can represent the sun. Some people even get a large pillar candle, inscribe it with solar symbols, and designate it as their sun candle. You can also add evergreen boughs, sprigs of holly, pinecones, a Yule log, and even Santa Claus. Consider antlers or reindeer, along with other symbols of fertility. Try incorporating sacred plants associated with the winter solstice as well. Evergreen boughs like pines, fir, juniper and cedar are all part of the evergreen family, and they’re typically associated with themes of protection and prosperity, as well as that of a continuation of life and renewal. Hang a sprig of holly in your house to ensure good luck and safety to your family. Wear it as a charm, or make holly water (which you probably read as holy water!) by soaking leaves overnight in spring water under a full moon. Use birch branches to craft your own besom for magical workings, and in spells and rituals related to enchantments, renewal, purification, fresh starts and new beginnings. Make Magic With the Colors of Yule! That Christmas Tree is a Pretty Pagan Thing!